Hamas criticizes Abbas: "We want a loyal, true representative of PLO"
(CNN) -- Palestinian Authority leader Mahmoud Abbas on Sunday defended a controversial decision to defer action on a United Nations report accusing Israel and Hamas of war crimes. Palestinian Authority leader Mahmoud Abbas says the report didn't get the "number of voices that we needed." Abbas said the draft resolution backing the so-called Goldstone report "did not gather the number of voices that we needed. We did not want this draft resolution to be turned into a number like all the other resolutions regarding Palestine that are still unimplemented." The report, written by South African Richard Goldstone who headed the U.N. investigation into the conflict, was particularly critical of Israel. Abbas has been the target of Palestinian anger after the decision to shelve action on the report, effectively halting any possible action against Israel -- or Hamas -- for six months. 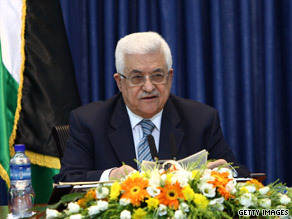 But in his remarks Sunday, Abbas said the draft resolution on the report was not widely accepted. "Since we felt that we will not be able to gather support, we asked for the postponement of the draft resolution for the upcoming session of the U.N. Human Rights Council," Abbas said. "We were able to give this resolution a number and a place on the agenda of the next meeting of the council. "The draft resolution was either totally rejected, or partially rejected, and even some countries expressed some reservations vis-a-vis this draft resolution," he said. "Based on my capacity as a leader, I would like to tell you that the decision to postpone the adoption of the Goldstone report was based on an agreement of various groups at the U.N. Human Rights Council." The report accused Israel of committing "actions amounting to war crimes, possibly crimes against humanity" during its military incursion into Gaza from December 27 to January 18. Goldstone demanded that someone be held responsible for crimes committed during the offensive. After the report's release in September, Israel's ambassador to the United Nations, Aharon Leshno-Yaar, called the document one-sided and shameful. Although Hamas militants were also implicated in the report, Hamas, the rival Palestinian faction that controls Gaza, also blamed Abbas for the postponement, saying it was a betrayal of the Palestinian people. Palestinian "leadership should be held accountable for Goldstone report delay," Khaled Meshaal, a Hamas political leader, said in an address in Damascus, Syria, immediately following Abbas' speech. "We want a loyal, true representative of PLO leadership." In his speech, Abbas said, "Hamas rejected the Goldstone report before it was published and after it was published. We are totally aware that this campaign by Hamas ... is serving their interest, of which is to postpone signature of the reconciliation agreement." The Hamas campaign also is aimed at turning the attention from happenings in Jerusalem, he said. "They are focusing on their own narrow interests instead of the interest of the Palestinian people. They left the Palestinian people to face the war machine of the Israelis in Gaza while the leaders of Hamas were hiding." "We want to punish everyone who was responsible for the hideous crimes committed against our children, our men and women especially in our dear Gaza," Abbas said. CNN's Kareen Khadder and Paula Hancocks contributed to this report.